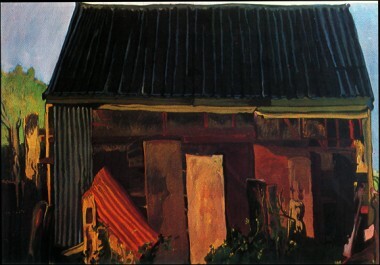 The Dark Barn, is a painting which comes into the period of The Yellow Barn and, Railway Bridge at Heyfield. It differs in one way in that it derives from various pencil drawings done at Heyfield, in the state of Victoria and later transferred to canvas. The basic design comes from a drawing of a hay barn with its tin roof and corrugated iron walls falling apart and exposing the timber structure and the bales of hay beneath. The work is formally set to centre of the canvas in a symmetrical design against a plain blue sky relieved by a green tree and some foliage. The second design used was a very detailed pencil drawing showing a Pre‑Raphaelite attention to detail. It was of some flowering shrubs which appear in the right foreground and left of centre. The dark appearance of the canvas gives it a seventeenth century Dutch feeling due to the use of various combinations of brown earths, ochres, and the dominance of a dark umber tint which appears as the base colour in the tin roof. The painting was planned with a deep tonal quality by priming the Belgian linen canvas support with a white acrylic preparation followed by undercoats of dark acrylic tints. In the upper area containing the sky the blue acrylic tint was laid on in a thin wash to allow the undercoat to appear. The roof was left as an unretouched undercoat overlaid with the details lightly applied. The remainder of the painting was carried out in oils. Matthew Moss modified the painting two years after its completion by adding further elements to the design. The artist inscribed the canvas, base right, with his signature, where it was created and the date.